Asphalt Crack Filling – Who Is Responsible? Me or the HOA? It goes without saying that although asphalt driveways are built to last, cracks are likely to appear especially after years of rigorous use. 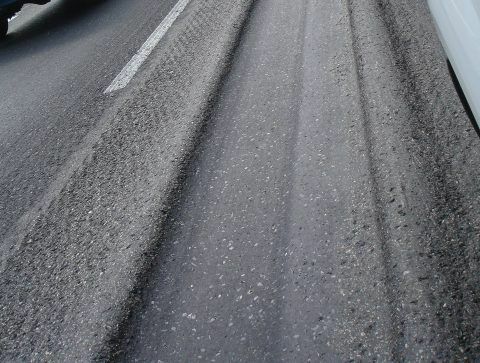 If this happens, it’s usually best for you to either contact a professional asphalt crack filling company or, if it’s the Home Owner Association’s responsibility to do so, then by all means get in touch with them. This is important because sealing the cracks will prevent you from spending a whole lot more, especially when the cracks get bigger and more conspicuous. Thankfully, asphalt cracks are usually visible even at the very early stage and you can easily have an asphalt crack filling project completed quickly and without any issues. Cracks should be sealed as soon as possible to keep water out of the crack and prevent the overall asphalt surface from being damaged by water intrusion. There are different kinds of cracks: hairline cracks, medium and large cracks. 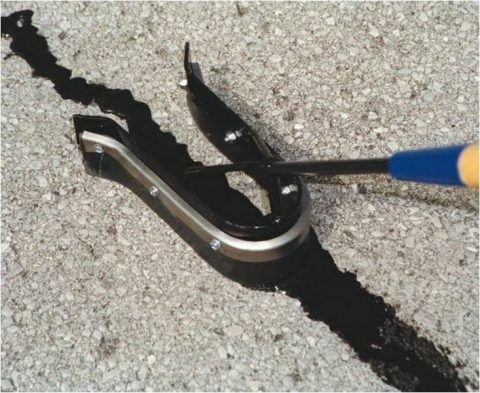 Hairline cracks can be sealed with a good grade sealcoat, however, larger cracks should be taken care of immediately with a top grade asphalt crack filling compound. You may also consider allowing a trained professional to come to check out a larger crack before you decide on what to do next. 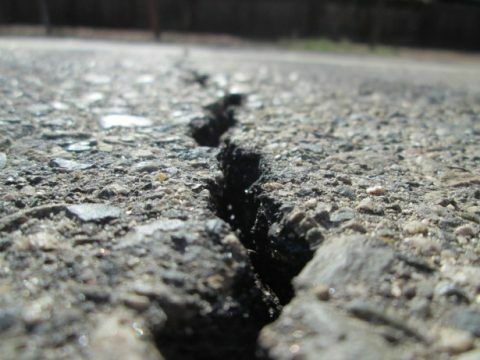 If the crack is too large, the asphalt may need to be repaired or replaced. A professional would also be able to determine if there are other types of asphalt substrate issues that are the root cause of the cracks. From there, you can either notify the Homeowners Association if you’re under one or contract or hire a good asphalt crack filling firm to do the job for you. Once you’ve concluded that the crack on your asphalt driveway needs to be repaired, then call a respectable asphalt crack filling company or the Homeowners Association (if you are under one). The HOA will then contact the firm on your behalf and have the crack sealed the right way before the situation exacerbates. The reason why you need to hire the right firm is simply that they have the right tools, materials and expertise to resolve the problem. First, they’ll clean the crack to ensure that debris is removed so the filler material with adhere. Once the filler material is applied, the professionals will test the crack filling for the seal. They’ll then wait for 20 minutes before adding any additional crack filling material. The work is then left to dry. Although the process appears simple (and it is for professionals), doing it yourself it’s not highly recommended. As mentioned earlier, not repairing that little crack in your driveway on time might only end up costing you so much more in the future as the crack gets bigger and bigger. Therefore, knowing the right path to follow (if the homeowner association is responsible for such tasks in your area) or hiring your own crack filling professional, make sure the action is taken as fast as possible. Does your pavement need asphalt crack filling? 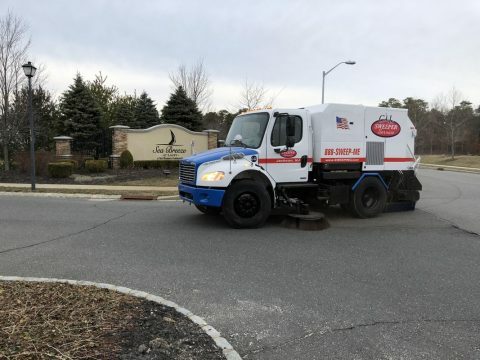 We have been providing asphalt crack filling and pavement repairs to builders, commercial property owners and communities in New Jersey for over forty years. We can service your asphalt with a variety of pavement and maintenance services keep your clients happy. If you’re in North Jersey, Contact us at 908-730-7884. 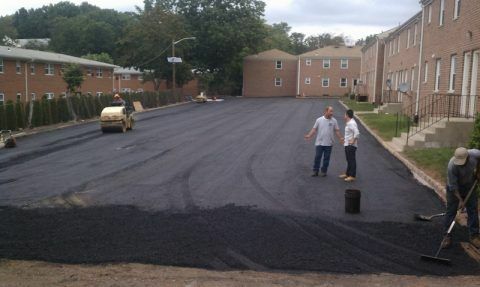 If you’re in Central New Jersey call us at 732-886-1940 to arrange for asphalt crack filling. Most builders use asphalt in driveways and parking lots because this material can be installed quickly and is durable. 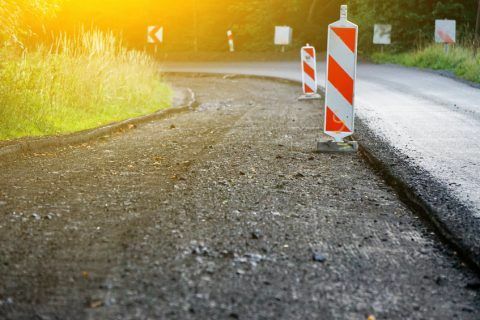 Asphalt streets, driveways and parking lots look good and, as one of the major benefits, asphalt repairs can also be completed quickly and easily. Asphalt does not crack easily and is flexible compared to other materials such as concrete or brick pavers. A properly laid asphalt driveway will last for up to 20 years if it it cared for and maintained properly. Unfortunately the construction site can be a very rough place for asphalt. This is why builders follow certain guidelines when installing streets, driveways and parking lots to avoid asphalts repairs to new pavement. Asphalt Repairs – The Base Layer and Top Layer. Difference between asphalt bottom layer and top coat. Most builders will bas a “base coat” of asphalt of a layer of gravel so contractors and trade professionals can access the construction site. This base coat is rather rough and serves as foundation for the final coat which is then installed when all construction activity is completed. Two main reasons why the top coat is usually the very last task on a construction site. First, builders they don’t want the pavement damaged by heavy construction vehicles during construction. Often subcontractors need to drive heavy equipment such as backhoes, delivery trucks and specialized construction equipment around the site to complete their assigned. 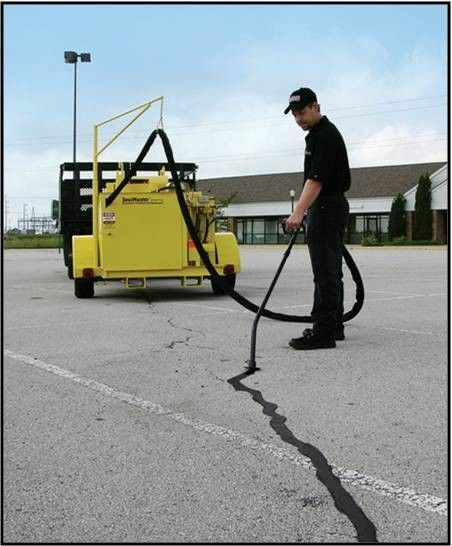 This equipment may leave marks, dents or impressions on the pavement. If the top coat were installed, this equipment could lead to additional asphalt repairs or, at worst, replacement of the damages asphalt. Second, when the building structures are complete, the top coat is installed, clean and free of debris/dirt/mud. The final line striping and curb stops are installed leading to a very pleasing aesthetic appearance. Clients and customers expect this final appearance to indicate project completion. Designate parking for subcontractors, motorcycles cause dents, large pickup trucks and commercial vehicles cause ruts. Subcontractors need to get to the site and complete their assigned tasks. They will follow the path of least resistance and park a closely to the site or building as they can. 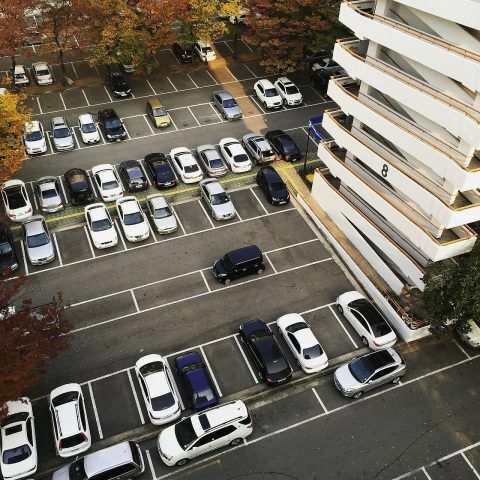 This can result in unusual or unwanted parking issues. Provide a designated parking area and then enforce parking. Provide consistent supervision so responsibility can be assigned to subcontractors who damage asphalt. 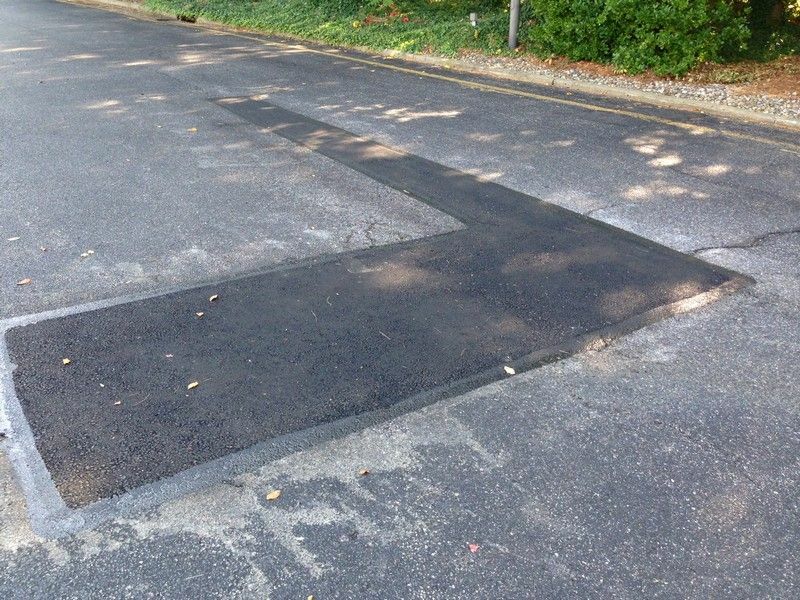 If a subcontractor damages asphalt, bring this to their attention immediately. Waiting any amount of time can lead to a “He said, she said” situation. Don’t schedule top layer until ALL construction and property grading is complete. See below for more details. Don’t “jump the gun” on installing the top coat. Generally, the base coat is quite servacable for ingress and egress to the property. 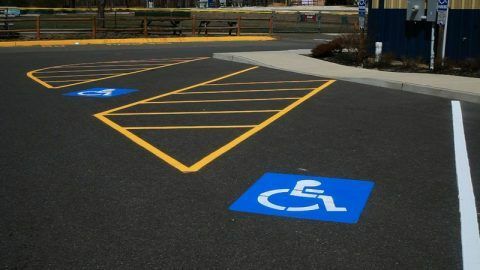 Unless the client has particular needs, save the top coat, striping and curb stops as the very last task for project completion. Prior to top coating, inspect the base coat and fill in any large dents or noticable impressions. Small dents can be cold patched. Small cracks can be filled and impression may not be noticable with a sufficiently thick top coat. Ruts and ridges can also be cold patched. Larger potholes and larger tears or ruts will need to be filled and hot patched. Don’t expect the top coat to serve as the asphalt repairs needed for this type of pavement issue. The pothole, tear or large ridge should be repairs and cooled prior to top coating. Bad paving should be redone by original contractor. Although it is understood that the base coat does not need to be aesthetically pleasing, this does not mean that sloppy installation is acceptable. If the the installation of the base coat is noticeably poor (extensive low spots creating large puddles, bad seams or eye-catching sloppy paving), have the original contract fix it. When an asphalt has been laid improperly, it is important to expect a professional asphalt repair company to conduct asphalt repairs. A reputed company will have wide experience in laying asphalt correctly to ensure that it lasts long without cutting corners. Professional companies will have advanced equipment to lay the asphalt quickly and to the highest standards. Your asphalt provider should use the best material available for your pavement requirements. Professionals identify the problems and will give you a plan and estimate to correct the faults. Do you have a need for asphalt repairs? We can service your construction site with a variety of pavement and maintenance services keep your clients happy. The first time I heard that quote, I thought, “what a realistic approach to planning…you never know what’s really going to happen!”. Over time, however, this has grown to be my favorite project management quote, simply because it proposes not only the need to plan, but also need to stay flexible in “expecting the unexpected”. In fact, I think every aspiring property manager would do well to read this quote, understand it and start applying it to maintenance projects. Each shopping center paving project should start with certain planning protocols to ensure the success and satisfactory completion. The first step in the project plan is determine the scope of your project. In this case, before paving the shopping center parking lot you need to understand the size and location of the project. For a newly built shopping center, there are fewer safety issues to deal with since there are no traffic, tenant or customer issues to address. This is not to imply that there are no safety issues, just fewer issues because business are not currently present. However, subcontractors and other building professionals are present and need to adhere to safety protocols. For an existing shopping center, the lost will require milling. 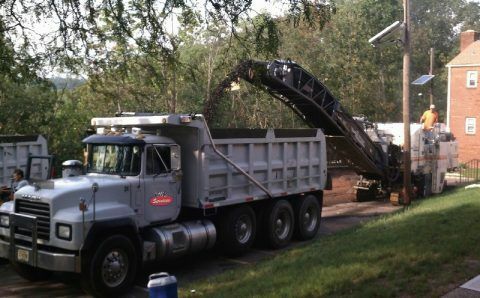 Milling is the process of removing the existing top coat of pavement for recycling and preparing the subcoat for fresh pavement. Planning the timing and safety this this step in an existing shopping center is particularly important to preserve access for existing tenants and customers served by those businesses. After dealing with the physical task of paving, you also need to reposition curb stops and bollards. A line striping project is also needed to ensure that the mall visitors are well directed. 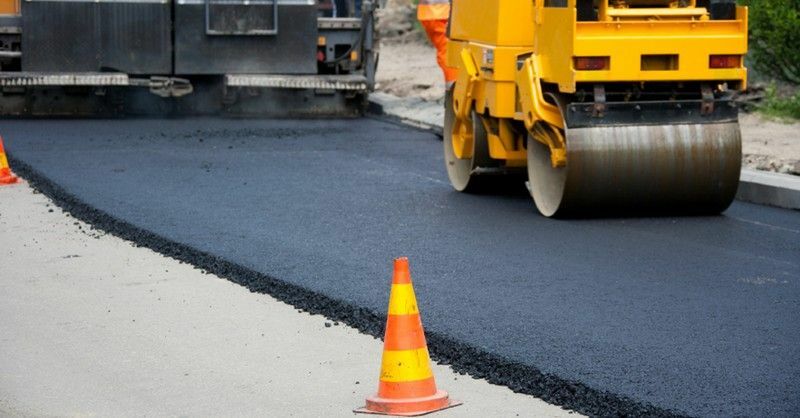 After identifying all the milestones and tasks for the paving project, formulate a viable and workable budget that will be reasonable and still maintain the quality of work done. During this stage, communicate the finer details of the project with ALL affected parties and inform them about the main goals and timing for your project. Take the time to explain expectations for them as well. Moreover, asses the obstacles that you are likely to face when preparing the lot for construction and the availability of machinery. Make sure that you anticipate most of the issues that may affect your project and have contingency plans to avoid delays. In this stage, ensure that you have contacted the necessary authorities and informed them about your project. Make sure that your contractors are ready to begin work as planned to avoid any delays. The workers whether skilled or unskilled should have the required safety equipment and appropriate safety protocols in place. In addition, ensure that all the necessary backup materials, labor or equipment are available to prevent any delays that may affect the construction process. After all the construction work is completed, assess whether expectations have been met. If not, make sure that before you close the contract, resolve any issues your specifications. Address any underlying issues that may have occurred during the process to ensure that there are no conflicts with post completion service responsibilities. After you have resolved all issues, you can officially close the project. If you want your construction shopping center paving project to be successful, you have to plan, prepare, execute, and assess. These processes help you to save money and avoid unexpected costs. 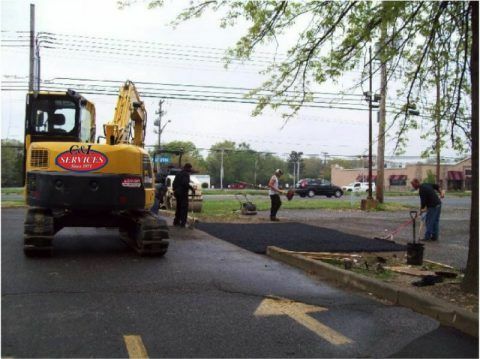 Are you considering a shopping center paving project? Do you need an experience property maintenance company to help you “refresh” your shopping center pavement? If you’re in North Jersey, Contact us at 908-730-7884. 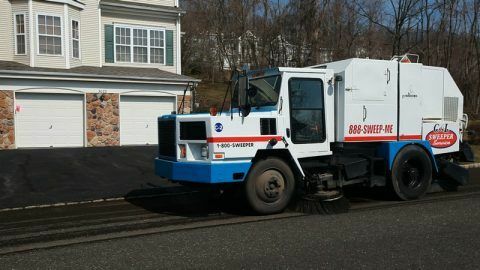 If you’re in Central New Jersey call us at 732-886-1940 to arrange for shopping center paving. Homeowner’s Association (HOA) Property Maintenance: Who Should You Trust? A storm inlet repair. A HOA has the resources to arrange for this complicated repair. People work hard throughout their lives with a particular goal in mind. Some want their every desire fulfilled which they could not while they were young. Some want to travel the world and enjoy different cultures. Some want to fulfill their craze of cars that they have had since they were children. Some want to spend their lives peacefully with their loved ones in a house they always dreamt of buying. The thing about buying a house, however, is that it’s not like once you buy a house, you are done with it. You have to keep it maintained, repaired and clean. This doesn’t just apply to single properties, but also other commercial properties as well. This is not an easy task, as many people find out with their first experience of home ownership. If you are also one of those individuals who want their property properly managed and maintained but prefer NOT to the job yourself, then a community with a Homeowners Association (HOA) is a good fit for you. There are many responsibilities that HOA’s do for you to maintain your property, including lawn maintenance, shrub trimming, power washing, concrete repair, street and parking lot cleaning, and possibly many other tasks. When you put HOA in charge of maintaining your properties, there are some established rules that resident need to follow. Not respecting these rules could lead to fines which the violator will have to pay. Property Maintenance – Who is Responsible for What? Parking lot paving. Another project that is better managed by a HOA. In this type of ownership, the homeowners own the structure and property. Some communities establish a HOA to maintain any common elements such as playgrounds, storm drain basins or landscaped entries, however in the majority of fee simple communities, the homeowner is generally responsible for doing the property maintenance work on his or her own home. In this type of ownership, the land is owned in partnership with others who live in the homes on the property. The owner of the structure is the homeowner. When it comes to property maintenance responsibilities, they are distributed between the HOA and the individual property owners. The HOA is usually responsible for exterior property maintenance, and the homeowners are generally responsible for the structure. The property maintenance responsibilities do vary significantly in these communities. The property in this type of ownership is owned by a corporation. If you buy such a property, you are actually buying shares of the corporation. The residents are generally free of maintenance responsibilities in this type of ownership. 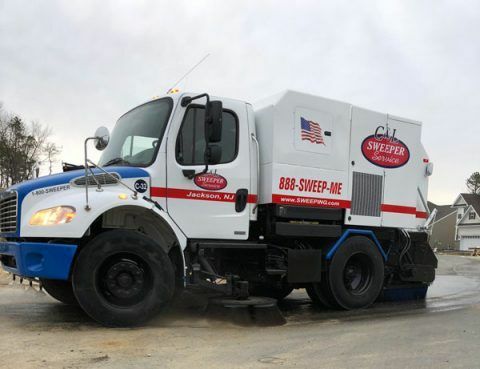 Community street sweeping. Definitely a HOA responsibility. Save time – Finding someone who could care for all the needs of your property can be a tiring task. You will either find someone who can repair concrete and not trim bushes, or someone who can trim bushes and not repair concrete. Instead of wasting time searching for people who perform different tasks, the Home Owners Association (HOA) will contract and manage all of these responsibilities. Reduce Stress – Maintaining a property can be stressful. Some people can hardly maintain one house, maintaining several is way over their heads. So instead of stressing about how you will handle the maintenance of several properties, let a HOA do its job. Save Money – One of the top reasons for living in a community with a HOA is that you will be able to save money. Think about it yourself. If you hire different people for each property maintenance task, you end up spending more money. Instead, hire one company that does all the tasks, in a much lesser amount. Property Maintenance – Finding a Trusted Partner? Are you involved with a Homeowners Association Board? Do you need a trusted partner to help with property management responsibilities? Shopping Center Inlet repair – When Is The Right Time? Timing is everything. There really is a best time to do most anything. When you see a crack in your windshield, it’s best that you have an auto glass specialist look at it immediately and repair it before it turns into a broken window. Timing is everything. Or if you hear about bad weather, getting the rain gear or snow shovels out so you are prepared for whatever is needed for access to your stores. Timing is everything. When it comes to Shopping Center inlet repairs, if you notice cracks or depressions that weren’t there before, it might be a good time to have somebody look at it. Timing is everything. 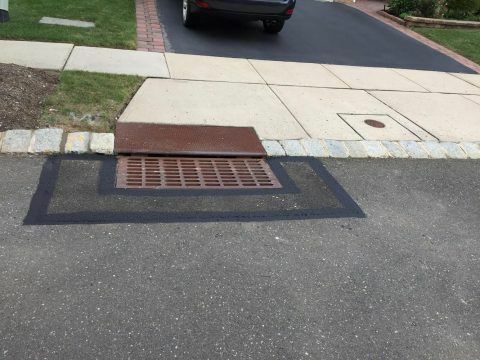 A standard shopping center inlet has a perforated or slotted metal grate embedded into the pavement. The grate covers a below-ground concrete structure. This inlet allows rain and storm water to drain into the structure to keep a parking lot from flooding. Shopping center inlets have a variety of names and are also known as storm drain, storm sewer, surface water drain/sewer, or stormwater drain. What Can Go Wrong With A Shopping Center Inlet? The most obvious issue for shopping center inlets is if they get clogged, it causes a flood. The simple resolution is to remove the debris clogging the drain (usually leaves or paper) and the water drains. Regular maintenance usually prevents this from happening, however if the shopping center is close to a heavily wooded area or if a recent event has generated a lot of paper (flyers, tickets or banners for a political rally) the inlets in the parking lot can create and unexpected blockage. An inlet that has dropped approximately six inches from previous position with very poor repair efforts. Unsafe and unsightly. The more costly and potentially unsafe issues can occur when a shopping center inlet begins to deteriorate. If water seeps in between the pavement and the inlet apron, this can cause erosion of the sub-strata and the collapse of the pavement surrounding the inlet. Several potential issues can result. The first is the pavement becomes unsightly. Visible cracks and deterioration are evident around the inlet and it appears neglected. The second issue is the pavement becomes unstable and unsafe. An individual driving (or even walking) on the pavement surrounding the inlet can cause it to collapse and damage the vehicle or cause injury to a pedestrian. The final issue is complete inlet collapse. The pavement around the inlet collapses and the infrastructure of the inlet disintegrates. This creates a major inlet rehabilitation project at a substantial cost. What kind of shopping center inlet repairs can be done? In many cases the asphalt perimeter of a storm basin can be repaired so the inlet is returned to its intended purpose, to drain stormwater. If the catch basin if the inlet has been damaged, it will need to be replaced. Both projects require specialized expertise for asphalt and concrete repair as well as the administrative expertise needed to coordinate engineers and local officials for construction permits. What Are The Pros of Waiting? There are actually no pros to waiting. Although it may appear that costs savings are achieved by waiting, the actual costs may be much higher if preventative maintenance is deferred. 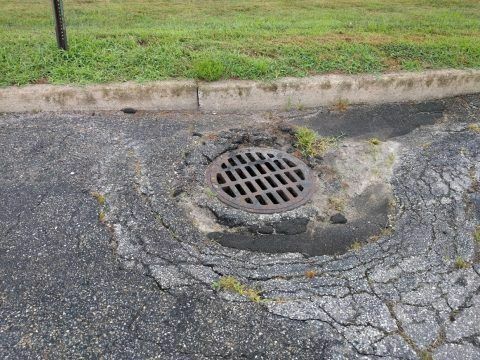 It is much less expensive to continuously inspect and prevent shopping center inlets so problems can be “nipped in the bud” compare to replacing asphalt. And replacing asphalt is much less expensive than replacing a shopping center inlet (requiring engineering, permit and possibly traffic fees). What Are the Cons of Waiting? As we mentioned above, timing is everything. The longer you wait for shopping center inlet repair, the higher the cost will be. The costs range from simple asphalt repair costs to major construction costs (and the most dreaded possible lawsuits). 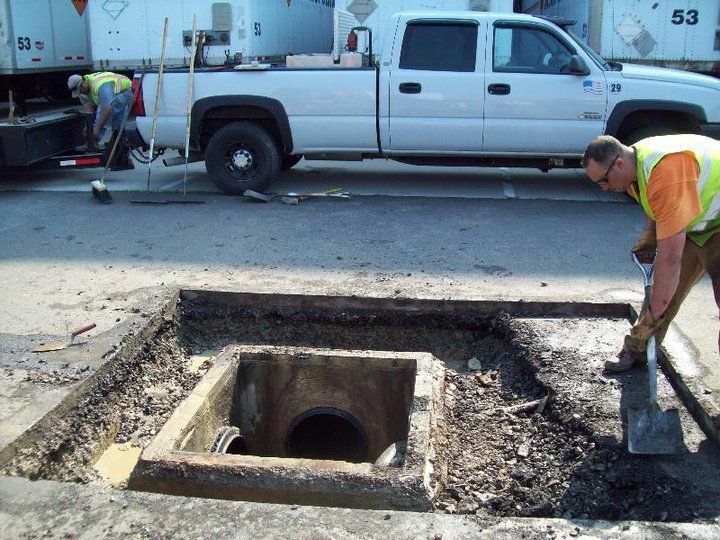 Timing is everything, don’t postpone your decision to conduct shopping center inlet repairs. Do you have a shopping center inlet that needs repair? 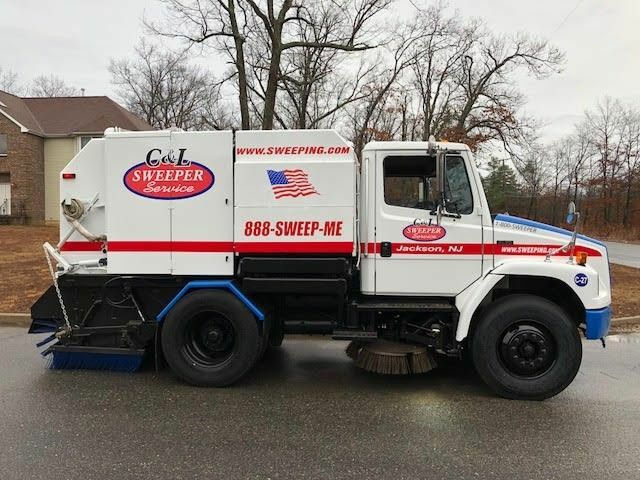 C & L Services is a third generation family owned property maintenance company. 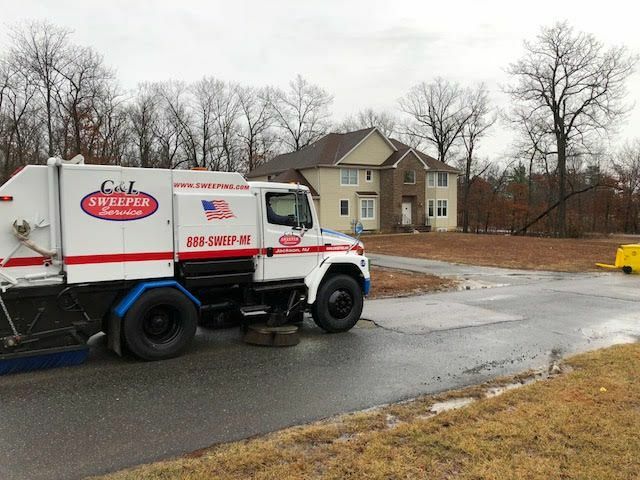 We have been providing inlet repair services to shopping centers, commercial property owners and communities in New Jersey for over forty years. 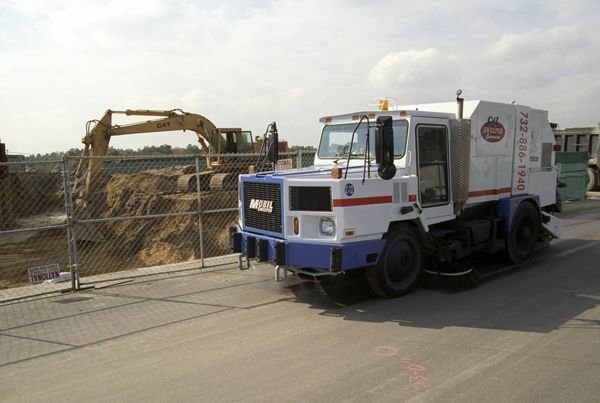 Our services include inlet repair, concrete repair, asphalt repair, and pavement maintenance. If you’re in North Jersey, Contact us at 908-730-7884. If you’re in Central New Jersey call us at 732-886-1940 to arrange for shopping center inlet repair.